Beamblitzer is a Bakugan Battle Gear and one of the pieces of Dragonoid Colossus. 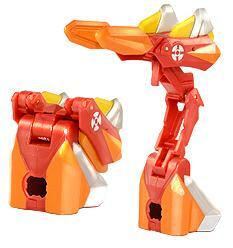 Beamblitzer is a Bakugan Battle Gear that forms part of Dragonoid Colossus’ powerful weaponry. It can blast beams of energy at its target with pinpoint accuracy. It's Gold version has 120 Gs. Purchase your Beamblitzer Battle Gear from Amazon now!